The Treasury of David: Spurgeon's Classic Work on the Psalms ReviewCharles Haddon Spurgeon was England's Prince of Preachers in the nineteenth century. Today he is still one of the most well-known and loved authors in the English language - with more of his books and sermons in print (over 100 years) than any other English writer. However, I am not endorsing his works simply because of his popularity or any man's for that matter. I am recommending the works of this man because he is one who listens to God. 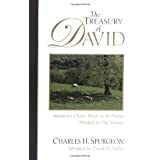 The Treasury of David is Spurgeon's Magnum Opus. If he had not written anything else apart from this masterful commentary on the Psalms, he would still be considered among the greatest Christian writers of all history. Students of the life of Spurgeon would know that he was not a strict academician. However, in all sense of the word, he was a man of learning who was acquainted with much of the scholarly issues of his times. Ultimately, he was a man who listen to God and labored for God's honor among men. This Treasury is the supreme monument to his 21 year labor. In the compiling of this Treasury, Spurgeon read up hundreds of theological texts and commentaries (much of which was quoted among his own notes and comments). In the original edition, Spurgeon also included his "Notes to the Village Preacher" on every Psalm - showing that Spurgeon will always be very important to anyone who wishes to speak from the Pulpit. I believe, however, that the worth of this book is even more for the lay student (Spurgeon's heart beats for them the most throughout his life). He attempted to share with them the best scholarship of his time and to lead them beyond scholarship to the worship of David's God. Reading this volume led me into worship of the same God - and I will never recover from Him! I exult in Him! We will see, as many other readers have seen that the greatest treasures of the ancient Israelite Kingdom was not the Temple that Solomon built, the gold and harem that the kings acquired nor even the Ark of the Covenant (that so many modern authors are speculating about) but these simple, unassuming songs that came from the worshipping heart of Israel's King David and his fellow worshippers. In this Treasury, we see a prayer for every occasion. We see the entire spectrum of the spiritual man's experience - penitence, courage, humiliation, power, confidence, exultation, doubt, weeping, laughter, awe, dread, fear and ultimately worship. Rightly did Faber exclaimed, "The Thought of Thee is almost prayer". This volume brings together the worship of David to Jehovah and Spurgeon to Jesus showing that they were both ultimately worshipping One same God. "Hear O Israel, the Lord thy God is One Lord". Want to learn more information about The Treasury of David: Spurgeon's Classic Work on the Psalms?